Red Bull's Mark Webber (left) makes a brilliant start to the British Grand Prix at Silverstone overtaking team-mate Sebastian Vettel. (CNN) -- Red Bull's Mark Webber has won the British Grand Prix at Silverstone. The Australian dominated the race from start to finish to record his third victory of the 2010 season finishing 1.360 seconds ahead of McLaren's Lewis Hamilton. Mercedes GP driver Nico Rosberg completed the podium placings. Afterwards, Webber described the result as "very special." "I did the best job I could and it worked out OK. 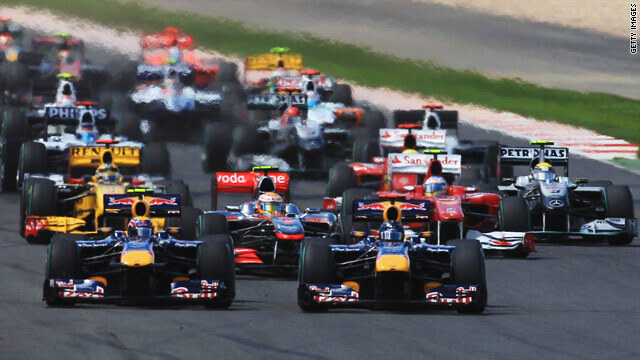 I enjoyed the grand prix, it was a good fight with Lewis Hamilton. I made a good start and I was very keen to make it my corner and it worked out for me," Webber said. Webber made a fantastic start, beating team-mate Sebastian Vettel to the first corner, Copse. The 23-year-old German struggled to control his Red Bull car down the pit straight and quickly veered off the track as he desperately attempted to keep pace with Webber. Vettel continued to lose ground to the leaders and soon radioed his team reporting a puncture on his rear right tire. The Red Bull driver -- who won two weeks ago at the European Grand Prix in Valencia -- fought his way back up the field, passing Force India's Adrian Sutil with one lap remaining, but had to settle for seventh place. The result means Vettel drops to fourth place in the world championship standings with Mark Webber moving up to third, 17 points behind championship leader Hamilton. Lewis Hamilton's second place means he extends his lead over Jenson Button at the top of the drivers' championship to 12 points. The McLaren driver was full of praise for Webber. "Mark did a phenomenal job today, so congratulations to him. Those guys are just so fast. I knew I wouldn't be able to outpace them," Hamilton said. The 2008 world champion also thanked his team. "The result is a reflection of the work the team put in. Jenson did a fantastic job today. So that's great points for the team and I guess we are still leading the constructors championship as well," Hamilton added. 2009 world champion, Button put his disappointing qualifying session behind him managing to finish in fourth starting from a grid position of 14th. "Ten places!!" Button said after the race, AFP reported. "It is so difficult to overtake here, so I had to make sure I had a good first lap and I made up six places. It's a fantastic result," Button said, AFP reported. In the scrap for lower places, Williams' Rubens Barichello finished fifth ahead of Sauber driver Kamui Kobayashi. Ferrari's Fernando Alonso finished down in 14th place after the 28-year-old was handed a drive-through penalty for going off the track to overtake Renault's Robert Kubica. McLaren lead the constructors championship with 278 points with Red Bull in second on 249 points. Ferrari are in third place with 165 points.